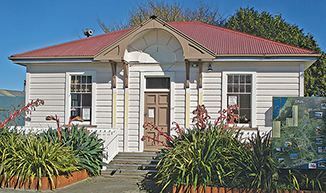 The old courthouse in Ōtaki is to become an arts centre. The heritage building, in Centennial Park on SH1, is to be leased to the Artscape Art and Craft Cooperative from Te Horo. The recommendation from the Ōtaki Community Board followed a request for expressions of interest from community groups keen to lease the space, the former home of the Ōtaki i-SITE. Four applications were received and an evaluation panel set up to select the most suitable tenant. Board Deputy Chair Rob Kofoed, who was on the selection panel, says it was a tough decision but he believes the art cooperative is a good fit. “We wanted to secure a tenant that was truly community focussed. I am excited about the exhibits, training sessions and demonstrations the cooperative proposes to run. The Artscape Art and Craft Cooperative, which currently operates at Hyde Park Village, Te Horo, consists of local artists and craftspeople who display and sell their art. Rob Kofoed says the lease to the group, initially for a year, with a right of renewal, will help grow the reputation of Ōtaki as the cultural, art and architectural centre for the district.